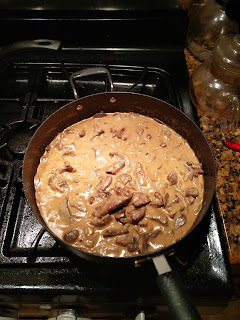 Here is the base recipe we used: http://www.food.com/recipe/beef-stroganoff-with-cremini-porcini-mushrooms-100655. We did modify some things that we thought were important. Alona's portion of the meal was created without any mushrooms as she does not enjoy eating the fungus. Kaspian's plate was just egg noodles. The egg noodles that we used were some that we made from scratch a few weeks earlier and had dried and saved them in the freezer. The egg noodles were the best part. This was by far not the best recipe we have made. It was quite disappointing. It took a very long time to make and was not very tasty. 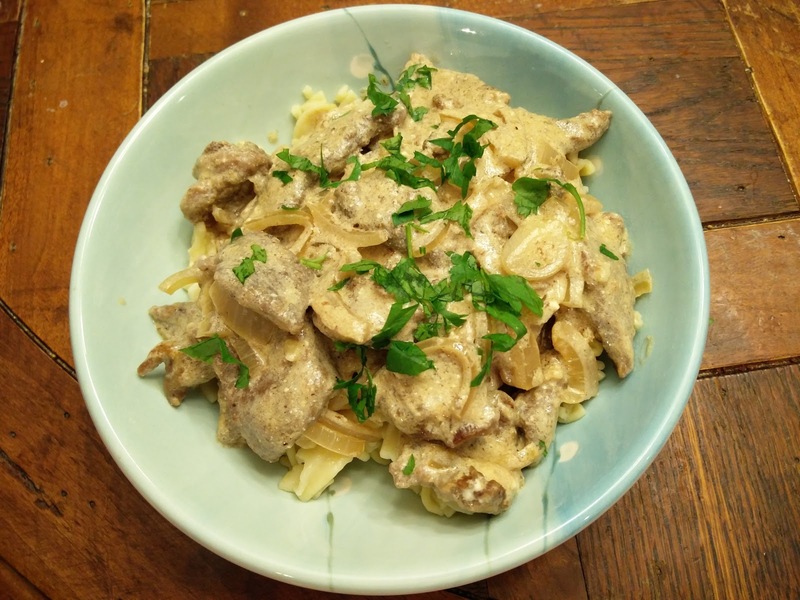 A beef stroganoff should simmer the meat in a creamy sauce for at least 20 minutes. This is what we will try next time. This particular recipe resulted in a tough-y tasting meat. The sauce was pretty good but had we not added the sour cream it would have been way too light for a beef stroganoff and almost soup-y. 1. Combine the beef broth and dried porcini in a small saucepan. 2. Bring to a boil, remove from heat, cover, and let steep for 30 minutes. 3. With a slotted spoon, lift the porcini out of the broth, chop coarsely and set aside. 4. Heat 1 tbsp of the oil and the butter in a large skillet over medium high heat. 5. 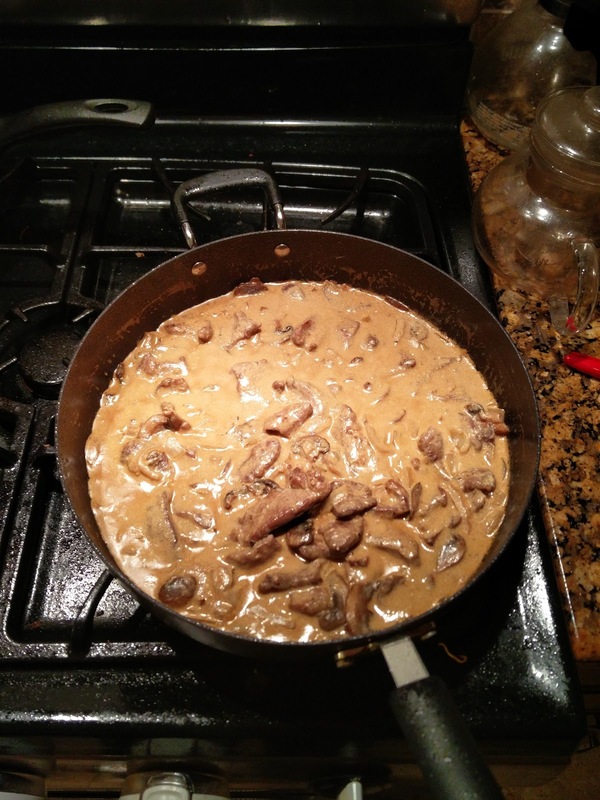 When the oil is hot, add the cremini mushrooms and saute, stirring often until they are browned, 5- 6 minutes. 7. Season the beef strips generously with kosher salt and pepper and dredge in the flour. 8. Add 2 tbsp oil to the pan and heat over medium-high heat. 9. When oil is hot, add the beef, spreading it in a single layer - brown it. 10. Remove beef to another bowl. 11. Melt the remaining 3 tbsp butter in the pan over medium-high heat. 13. When the onions just start to brown (about 4- 5 min), pour in the reserved porcini soaking broth. 14. Stir in the mustard, Worcestershire sauce, porcini, cremini and beef, along with any accumulated juices. 16. Serve over cooked noodles, sprinkled with parsley. The idea behind this recipe. The beef stroganoff is a wonderful creamy dish that should be great for a weeknight dinner. 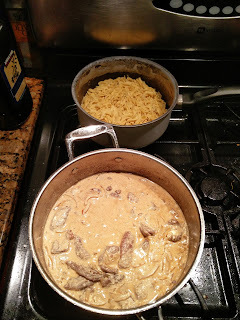 This way of preparing beef stroganoff. The amount of time saved by not simmering it was not worth it. The pre-frying is also not necessary as it cooks the beef and does not allow it to absorb the creamy sauce flavors. I just want the noodles. He loved the home made noodles and ate a whole bowl. 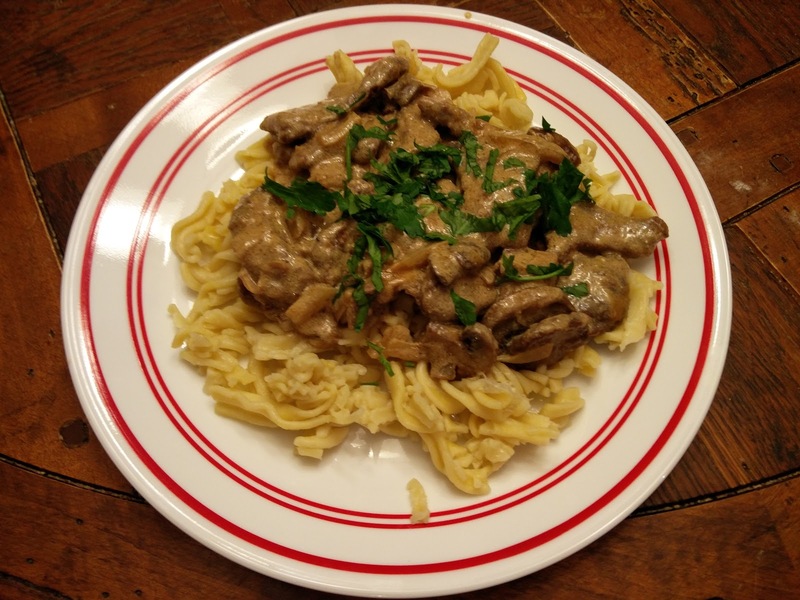 Next time, we will attempt a recipe that is more creamy and cooks the beef in the sauce for a longer period of time. The beef really needs to simmer in the sauce and absorb the cream. We had Mitch over for dinner and his comment was "Definitely not the best dinner I've had here".